Anyone remember Biafra? It was a very poor part of Africa which had suffered a terrible drought and hundreds of emaciated kids were dying of malnutrition. If was about 30 years ago and was, I think, the first time TV pictures had captured the scale of the problems of famine like this and mobilised the world to help. Anyway, any suggestion that I could be mistaken for a Biafran child after another day of the 5:2 diet, are as disgraceful as they are true in my own mind. The phrase “running on empty” sprang to mind as I trekked around the damp and unappetisingly, drizzle-obscured Sussex countryside yesterday morning, dreaming of finding new clients to enjoy the foreign exchange services of Currencies Direct. I have a picture taken a few days before of Hiorne’s Tower, on the Arundel Estate, which provided the backdrop to an episode of Dr Who, featuring the Cybermen, which in was going to feature today, until it was as I popped into the Co Op, just to look at the food, that I spotted the headline in the local paper, which I decided to feature in today’s column instead. 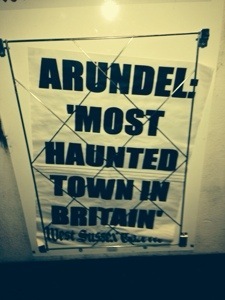 It seemed ironic that I should see this on the day when I was being haunted by a lack of food, and had no idea that Arundel was so similarly haunted. I must look a little like a ghost myself at the moment so I should fit in, and talking of fitting in, I shall be needing a smaller wardrobe at this rate. That does not mean a smaller storage area. At least those pesky bathroom scales are beginning to see some sense, with progress on their rehabilitation into the honest world beginning to commence. So what do you do when faced with a miserable situation, miserable weather and no chance to go to a pub and drown your sorrows, and looking at food does no good? You start looking at holiday brochures. We have not had a holiday since October when we returned from three months in France, so planning something is well overdue. Today then, joy of joys, I can eat real food again, but more importantly, imbibe beer and wine again. I have missed them both. After all, the last time I was able to indulge was Tuesday evening. Thursday as any civilised person knows is the start of the weekend, and am determined to help reduce the stocks of London Pride somewhere today. Unless it all goes hideously wrong, we will be dining this evening on some goose breasts procured at the Arundel Farmers Market last weekend, if not then I fear they will be in the dog. Tomorrow sees us in London again, this time to commune with Sir Lez Paterson and Dame Edna Everage at the London Palladium on Barry Humphries’ Farewell Tour. Any suggestion that I chose this particular theatre show when on a diet day is entirely founded. The tour is called the “Eat, Pray, Laugh”. Eat when you can, pray for food and laugh when you get it. Not being a fan of late night trains, full of drunk people returning from theatre shows, we shall stay in London again, this time in the depths of High Holborn, which is not a bit like trying to describe a place truthfully. It is barely 20 feet above sea level for the most part. Other examples of inappropriate names might be Scintillating Scarborough or Rocking Rochdale (can you tell I have been writing my northern baiting blog column for Onboard Online? Due to hit the ethernet shortly). ← Cheese eating surrender monkeys? And WILL butter both sides of his toast ! Is a SHORT-TERM reduction in size ! Then it’s back to the steak and French fries ! Can it be he just wants to look cute ? Just a way to fit back in his suit ? His belly hangs over his belt ! Though his wish to lose weight is heartfelt ! He’s as fat as a pig ! He makes Fatty Mc Fattso look svelte !!! Only joking…you know I love you really…even if you are gargantuan !!! Such moaning is NOT entertaining !! Oops, sorry, it is hard to be funny when you are hungry!